After much debate, Congress may pass major reforms to reduce the cost of health care in the U.S. However, many important questions remain unanswered. For example, current health care reform includes restricting physician financial ownership of hospital or other health care system assets in which physicians practice. Recent research suggests that when physicians have this type of financial ownership, patient Medicare costs are higher compared to if physicians have no financial ownership. Physicians are typically paid salary plus a share of hospital or health care system profits or derive income from the number of patients treated or tests completed for this type of hybrid contract arrangement. When physicians have no ownership in the health care system, they are paid only a fixed salary and operate under an employment contract, which means physicians become employees of hospitals or health care systems. Briefly, we review how organizational economics research has viewed physician ownership and its relation to the emergence of health maintenance organizations (HMOs) and managed care contracting. Recent research has attempted to link increased physician ownership to higher Medicare costs. Although this is only one part of the overall cost structure of health care to be considered, it is an important one to rural America given that a higher proportion of the rural population is over age 65 compared to urban areas and therefore participates heavily in the Medicare program. Using data from the American Hospital Association, we examine hybrid and employment contracts hospitals use when recruiting physicians. We find some evidence that Medicare per capita costs are positively correlated with hybrid contracts in urban markets, but not in rural. This implies that restricting physician ownership in rural markets may affect the recruitment of physicians and, therefore, access to health care and the overall health of rural economies without reducing costs of health care. The vertical integration between hospitals and physicians has been examined extensively, especially in the 1990s as managed care contracting and HMOs emerged to curb costs and new contract arrangements were organized among hospitals, physicians and HMOs to compete for patient volume (Coles and Hesterly, 1998; Cuellar and Gertler, 2006). Vertical integration has been primarily viewed from the provider—hospital or health care system—perspective and generally refers to the level of financial investments made in health care assets and which party has the lion’s share of the associated decision rights over those assets (Alexander and Morrisey, 1988; Mick, 1990). As a result, greater vertical integration has meant one party makes the largest financial investment in health care assets and retains the lion’s share of decision rights over those assets. But how do we understand what more or less vertical integration between physicians and hospitals looks like in practice? One approach is to consider the use of two alternative contracts that hospitals use to recruit physicians. If hospitals offer to pay physicians with only a fixed salary, physicians become employees of the hospital or health system. This establishes an employer-employee relationship providing the hospital with the lion’s share of decision rights about many details of physician practice. Vertical integration increases for the hospital. Alternatively, less vertical integration for the hospital would mean investments and decision rights are shared between physicians and hospitals. Multiple forms of hybrid contracts are used by hospitals and most provide one or more of the following to physicians: (1) physicians share in the profits of treating patients; (2) they invest financial resources in the health care infrastructure; and (3) physicians ultimately gain greater decision rights over patient care and the use of health care assets. Salary plus any or all of these additional attributes creates a hybrid contract between physicians and hospitals. Hybrid contracts offer physicians salary plus a share of profits or income derived from patients treated, number of procedures conducted or some other performance metric. From a practical perspective, recruitment of physicians has been more difficult for hospitals located in rural areas. Simply put, rural hospitals must offer physicians an attractive set of contract terms; otherwise, physicians opt to practice in more competitive, urban markets where increased access to socioeconomic amenities and higher salaries exceed benefits in rural markets. As a result, rural hospitals often use high-powered incentives to recruit physicians, including hybrid contracts that provide salary, additional income and some decision rights over hospital assets (Barnes and Fannin, 2006; Fannin and Barnes 2007). A related stream of research has examined how physician ownership of health care assets affects the patient cost of health care in urban and rural markets. Some studies have concluded patient costs are lowest when hospitals have more vertical integration via the use of employment contracts with physicians. Similarly, if physicians own health care assets, patient costs tend to be higher. For example, Sirovich et al. (2008) examined physician decision making in the United States to explore the relationship between discretionary physician decisions and the patient cost of care. They concluded physicians who operated in high-spending regions had increased patient visits and recommended more screening tests compared to physicians in low-spending regions. The upshot was both sets of physicians followed guideline-supported interventions. Similarly, Sutherland, Fisher and Skinner (2009) examined per capita Medicare costs in urban and rural areas. They examined the effect poverty, income, sickness of patients and other personal and regional factors have on the variation in per capita Medicare costs. They concluded most of the variation between high and low cost regions cannot be explained by these factors. Instead, most of the variation was attributed to physician discretionary decision making. Specifically, patients in high cost regions spent more time in hospitals and underwent more magnetic resonance imaging (MRI) and computed tomographic (CT) tests. However, the type of hybrid contract that led to the overprescribing of tests was not identified in either of these studies. In an interesting case study, Gawande (2009) researched the differences in per enrollee Medicare costs between two border towns in El Paso and McAllen, Texas. Gawande examined several factors that might explain the relatively higher Medicare cost in McAllen. His analysis showed such factors as poverty level of the area, relatively sicker patients and many other factors together did not explain the increased cost. Instead, his analysis suggested the higher cost in McAllen had more to do with physician ownership of facilities. He concluded physicians were influenced by high-powered incentives for profit. In McAllen, physicians prescribed more tests, surgical procedures and other revenue generating activities to boost facility revenue, and therefore, their incomes. Gawande compared McAllen to the Mayo Clinic where physicians were paid a salary and collaborate regularly to improve quality of services. Gawande suggested the key to lowering health care cost was to reduce or eliminate the financial incentives that motivate physicians to overprescribe tests and other procedures in McAllen. Practically, the health care system in McAllen should have used more employment instead of hybrid contracts when recruiting physicians. Although these studies suggest physician ownership increases patient cost, the studies have important limitations in generalizing results for policy implications. Most importantly for our interests here, no study has examined rural/urban differences in the relationship between Medicare cost and the type of contract used by hospitals to recruit physicians. Does the use of physician employment or hybrid contracts correspond to the presence of lower or higher per capita Medicare cost as suggested by previous studies? The types of hybrid contracts used by hospitals to recruit physicians include Independent Practice Associations (IPAs), Physician Hospital Organizations (PHOs), Management Service Organizations (MSOs), Group Practice without Walls, Open Physician-Hospital Organization (OPHO), Closed Physician-Hospital Organization (CPHO) and Medical Foundations (Fannin and Barnes, In Press). Hospitals also use employment contracts. For example, Figure 1 shows the percentage of U.S. hospitals within a rural Hospital Service Area (HSA) that used employment contracts to recruit physicians. The darkest areas represent the highest percentage of hospitals that used employment contracts. This occurs more in the Midwest, Western and some Northeast areas of the United States. For a more detailed look at the relationship between physician ownership and costs, we correlated hybrid and employment contracts with per capita Medicare costs in rural and urban markets based on HSAs. Since the Medicare program has significant information about the location of patients, 3,436 HSAs were created as part of the Dartmouth Atlas of Health Care (1999) to track Medicare expenditures per region. We used the 2004 American Hospital Association data on hybrid and employment contracts with Medicare per capita cost to calculate correlations. For both contracts, we correlated the three year (2004-06) average per capita Medicare cost (Dartmouth Atlas of Health Care, 2009) with the percentage of hospitals using these contract types (Table 1). Correlation results indicate two insights about physician ownership and average per capita Medicare cost. First, the average per capita Medicare cost was negatively and significantly correlated with employment contracts in rural and urban markets. Although we cannot imply causation from such an analysis, the negative correlation matches our initial expectations for this relationship based on previous research. The same is true for the positive correlation between cost and hybrids in urban markets. Secondly, and most noteworthy, correlation results did not establish a positive relationship between cost and physician ownership in rural markets. Current law (Section 1877 [42 U.S.C. 1395]) prohibits a physician from having an investment/ownership stake in any entity in which he/she refers patients. It also provides exemptions for any rural—non-MSA—health care entity and for hospitals in urban areas. Proposed law in the amended Senate version of the approved U.S. House health care reform bill (H.R. 3590.AS, Title VI, Subtitle A, SEC. 6001) (US Senate 2009) titled “Limitation on Medicare Exception to the Prohibition on Certain Physician Referrals for Hospitals” would eliminate the exemption for both rural and urban hospitals. As a result, physicians would not be allowed to financially own facilities in which they practice in rural or urban markets. But such a restriction does not appear necessary in rural markets as our analysis suggests that physician ownership is not positively correlated with average Medicare per capita cost. Reform by way of restricting physician financial ownership in rural markets may have an adverse impact on rural hospitals and economies. Because rural hospitals typically represent the largest or second largest employer in rural areas, this type of reform could also mean job losses in rural economies. Why? Rural hospitals already have difficulty recruiting physicians as urban markets offer higher wages, lower cost access to amenities and better employment opportunities for physicians’ spouses. Further restricting physicians from investing in rural practice—one of the few incentives rural hospitals can use to add income to a physician’s salary and tie rural hospital performance to physician performance—could make recruitment even more difficult for hospitals in rural areas. Further limiting recruitment options for rural hospitals could mean fewer physicians practicing in rural areas, which in turn could mean less access to health care and potential job losses in rural economies. 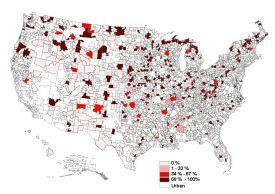 If the difference between urban and rural health care markets is ignored, restricting physician financial ownership in rural markets may have an opposite cost/access effect in rural America to that sought—rural residents may have less access to health care and at a greater cost. Alexander, J.A., and Morrisey, M.A. (1988). Hospital-physician integration and hospital costs. Inquiry 25(3), 388-402. American Hospital Association. (2006) AHA Annual Survey Database FY 2004. [database on CD-ROM]. Chicago, IL: Health Forum. Barnes, J.N. and Fannin, J.M. (2006). Vertical integration business strategies in healthcare markets: Theory and Evidence. Southern Business and Economic Journal, 29 (3&4), 69-87. Coles, J.W., and Hesterly, W.S. (1998). The impact of firm-specific assets and the interaction of uncertainty: An examination of the make or buy decisions in public and private hospitals. Journal of Economic Behavior and Organization, 36, 383-409. Cuellar, A.E, and Gertler, P.J. (2006). Strategic integration of hospitals and physicians. Journal of Health Economics, 25(1), 1-28. Dartmouth Atlas of Healthcare. (2009). Medical Care Cost Equation. Available online: http://cecsweb.dartmouth.edu/atlas08/datatools/mce_s1.php. Accessed Nov 15, 2009. Dartmouth Atlas of Healthcare. (1999). Appendix on the Geography of Health Care in the United States. Available online: http://www.dartmouthatlas.org/faq/geogappdx.pdf. Accessed Nov 15, 2009. Fannin J.M. and Barnes, J.N. (2007). Recruitment of physicians to rural America: A view through the lens of transaction cost theory. Journal of Rural Health, 23(2):141-9. Fannin, J.M. and Barnes, J.N. (In Press). Spatial model specification for contractual arrangements between rural hospitals and physicians. Review of Regional Studies. Gawande, A. (2009, June 1). The cost conundrum. The New Yorker, pp. 1-8. Mick, S.S. (1990). Explaining vertical integration and healthcare: An analysis and synthesis of transaction cost economics and strategic management theory. Chapter 8 in Mick, S.S. and Associaties. Innovations in Healthcare Delivery: Insights for Organization Theory. San Francisco: Josssey-Bass Inc. pp. 207-240. Sirovich, B., Gallagher, P., Wenneberg, D. and Fisher, E. (2008). Discretionary decision making by primary care physicians and the cost of U.S. healthcare. Health Affairs, 27(3), 813-823. Sutherland, J., Fisher, E. and Skinner, J. (2009). Getting past denial—the high cost of healthcare in the United States. New England Journal of Medicine, 24:361(13), 1227-30. U.S. Senate. (2009). 111th Congress, 1st Session. H.R. 3590, Patient Protection and Affordable Care Act. ONLINE. Library of Congress Thomas. Available online: http://hdl.loc.gov/loc.uscongress/legislation.111hr3590. Accessed December 1, 2009. Correlation between 2004-06 Per Capita Medicare Costs and 2004 Hospital Physician Arrangement Type by HSA region. * Significant at 10%, ** Significant at 5%, *** Significant at 1% and based on 1437 rural and 1084 urban HSA regions. HSA regions not counted include 356 HSAs classified as “exurban” that included a mix of metro and non-metro counties in the HSA and 415 HSAs that completed the AHA survey but stated that none of their physician arrangements could be identified to the categories provided. James Barnes, Ph.D. (jbarnes@agcenter.lsu.edu)is an Assistant Professor, Director & Program Leader for Community Rural Development, Delta Rural Development Center, Department of Agricultural Economics and Agribusiness Louisiana State University Agricultural Center. J. Matthew Fannin, Ph.D. (mfannin@agcenter lsu.edu) is Assistant Professor | Louisiana Center for Rural Initiatives, Dept. of Ag. Economics and Agribusiness, LSU Ag Center, Baton Rouge, La.